You tend to laugh at things when you’re so high above they pose no threat. I try not to, but we all do it. Last week’s heat became real, when a strong complex of storms dropped power to the house and plenty of other people (close to 170,000). Some lost it Tuesday evening with storms, others in my case were in the dark early Thursday morning when a specifically strong storm with 60mph+ winds romped through from Central to SE Michigan. Power flickered, and went out. At the time the worst thing on my mind was the weather station not reporting data to the masses! Because everyone does that, right? Since power was gone for a day and a half, I had to wait to see the differences and backlog to wunderground when I got the chance. Here is a snapshot from the software with assorted variables checked off. It’s a little busy, will need to find a good balance down the road. Line chart showing the first power outage storm at 4:30am on July 5th, and a second round at 2:30pm. I goofed up this one, forgot to put in temperature measurement. With the hot temperatures, we were sure to break some records right? Yup, we did, since right around 1936. The NWS Grand Rapids office has a pretty good wrap up of the event if you want to check it out. Top of the month of July to you. Thursday brought the heat. While my station topped out at just over 98F, stations near Detroit did hit the triple digits. Heat indices were easily into the lower 100s across much of central and southern lower Michigan. I hit 105F. I took some time to look up some climate information, since we seem to be a little off track this year. A quick glance at these graphs from the NWS in Grand Rapids, shows Lansing precipitation levels in 2012 a shy bug compared to 2011’s deluge. Also, you can see the unpredictable March temperatures. 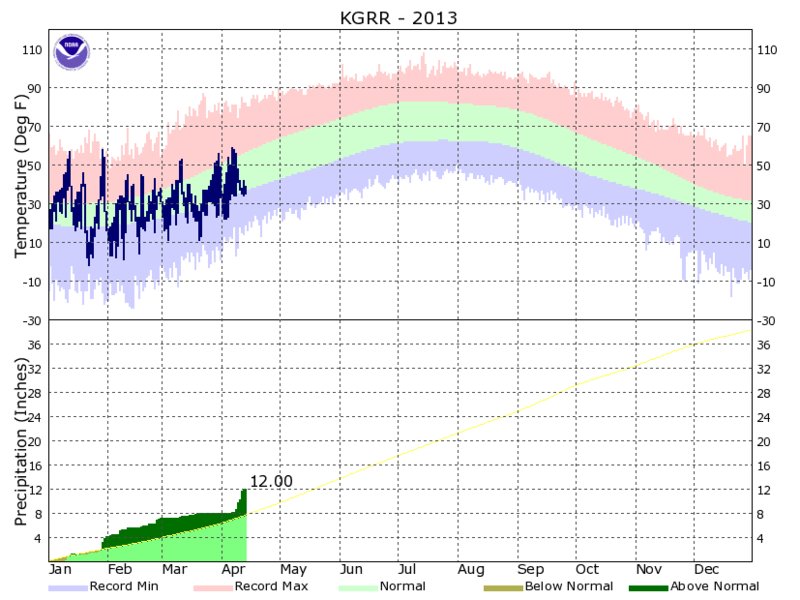 This year we had our heat spike into the lower 80s, last year it was a plummet into the lower 20s/teens. If you’re interested in viewing other years, check out this page. 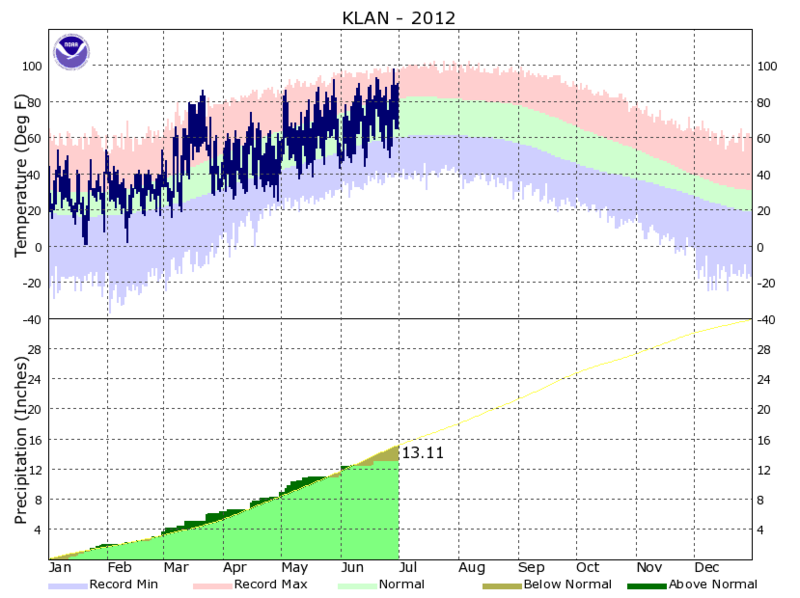 Annual temperature/precipitation for 2011 in Lansing, MI. The dry has been apparent. Our rough 3 inch deficit has burnt grass to a crisp and left some streams aching for life. What causes our dry spells? Some blocking features contribute to the dry weather by forcing the jet stream and other components out of our region and this complicates chances of rain. I will need to look into this further. Below is a map of how far off we are from ‘normal’ precipitation for the month of June. Much of southern lower Michigan is in an area where just 5%-25% of normal rain measurements have been met. Friday brought to life an interesting weather feature. Derechoes are long-lived convective systems that move fast, and provide high straight-line winds. This derecho was indeed long-lived as the path included the photo below, and eventually went out to DC. The sky was dark enough to be storm threatening from 2 counties north. A thorough review of this event can be found here including CAPE, CIN, and weather balloon analysis(oh goodie). The outlook continues to be warm. High temps this week will remain in the lower to mid 90s. At least through mid-week, we carry a chance for thunderstorms. So perhaps some of the drought threats will be quenched, at least locally. Best chance looks to be Tuesday when a short-wave disturbance tries to fire some showers and storms.